For more than 2,000 years, mathematics has been fundamental in a liberal education; in modern times, it has become the language of the natural sciences and a powerful tool in the social sciences. The mathematics curriculum at Pomona College is as well-suited to the student who wants a liberal arts introduction to mathematical thought as it is to the social or natural scientist who needs technical expertise in mathematical, statistical and computational methods. The mathematics major provides a broad and comprehensive offering of courses in all the mathematical sciences, including probability, statistics and operations research, as well as in the traditional areas of pure and applied mathematics. 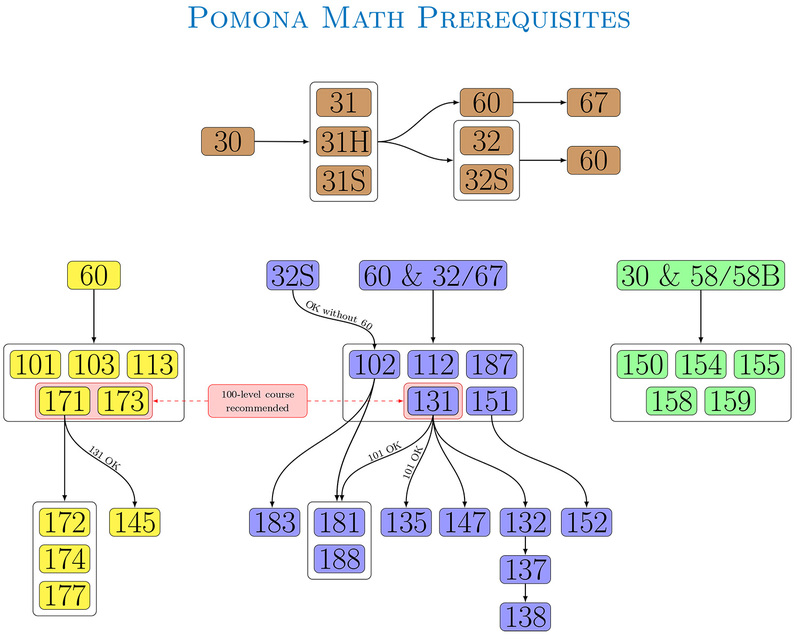 Pomona joins with the other Claremont Colleges in offering its students courses from some 50 faculty mathematicians (see the Claremont Colleges list of faculty and course rotation information). Programs in Claremont range from the usual B.A. to a combined B.A.-M.A. program offered jointly with Claremont Graduate University to the Claremont Graduate University Ph.D. program in pure and applied mathematics. Brochures describing all mathematics courses in Claremont are available either from the Mathematics Department or the Office of Admissions. The department also offers a minor. Students, with the help of their academic advisor, will use the “Math Path Guide” as well as information about the student’s prior academic record to begin their mathematical journey. Most will enter MATH 030 PO , MATH 031 PO , MATH 031H PO , MATH 031S PO , MATH 032 PO , MATH 032S PO or MATH 060 PO , but alternatives may be chosen based upon advising. Departmental Policy on Grades and Prerequisite Courses. To enter MATH 031 PO , the grade earned in MATH 030 PO must be C-minus or better; for courses numbered MATH 032 PO or above, the grade earned in prerequisite courses must be C or better. Because of widely varying preparations among students in the calculus courses, it is expected that they will need to fill various gaps in their backgrounds during the semester, with help from their instructors. Students must earn a letter grade of C-minus or better in each of the eight upper-division mathematics courses required for the major.